You strive to create a symmetrical, proportional physique. This book will lay out step-by-step training routines specifically created to bring up lagging muscles' development. This chapter will help you build better calves! Chapter 2 - What is Skeletal Muscle Hypertrophy? 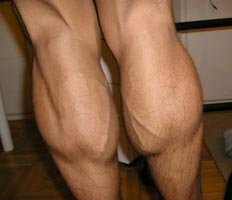 Most Muscular's Calves - BodySpace. Each group of lower leg muscles performed as specific task. The anterior muscles are dorsiflexors at the ankle (bringing the top of the foot towards the leg) and extensors of the toes (lifting the toes off the ground). The lateral muscles evert the food (lift the lateral side off the ground). The posterior muscles are primarily plantar flexors (lift the heel of the foot off of the ground) and flexors of the toes (curl toes). Inversion of the foot (lifting the medial aspect) is accomplished by specific anterior and posterior muscles, which will be discussed individually. The muscles of the calf (posterior) can be further divided into superficial (near the surface) and deep (near the center) muscles. The superficial muscles include the gastrocnemius, plantaris, and soleus. The deep muscles include the flexor digitorum longus, flexor hallucis longus, and tibialis posterior. By gaining an understanding of the anatomical structure and function of the muscles of the lower leg, it will become clear as to how to properly exercise and target these muscles. Our discussion of the lower leg muscles with start with the prominent superficial posterior calf muscles. The gastrocnemius is the most prominent and superficial muscle of the calves. This large posterior muscle has two heads: medial and lateral. The medial head of the gastrocnemius originates on the posterior distal femur, near the medial condyle. The lateral head originates on the posterior distal femur, near the lateral condyle. Both of the heads unite at about midway point of the lower leg into the calcaneal tendon. The calcaneal tendon, commonly referred to as the Achilles tendon, then inserts into the calcanius bone. The primary function of the gastrocnemius is plantar flexion of the foot. It also assisted in flexing the knee when the leg is not bearing weight. When the leg is bearing weight, flexion cannot occur at the knee unless dorsiflexion at the ankle accompanies it. Therefore, extension of the knee is assisted by the gastrocnemius. The plantaris is a small muscle, with a muscle belly only 2-4 inches long, but has a very long tendon. It originates at the lateral epicondyle of the femur, just above the origin of the lateral head of the gastrocnemius. The long tendon of the plantaris passes between the gastrocnemius and soleus and inserts into the calcaneus, anteromedial to the calcaneal tendon. The plantaris has two functions: assist in knee flexion and ankle plantarflexion. Because of the size and structure of this muscle, these actions are weak. In animals, especially the cat, the plantaris is much larger and inserts onto the bottom of the foot. This setup allows for animals to be able to run faster and jump higher than humans. The soleus lies deep (right under) to the gastrocnemius. The soleus also has two heads, though not as pronounced as the gastrocnemius' heads. The medial head originates on the posterior tibia and the lateral head on the posterior fibula. These two heads unite and insert into the calcaneal tendon. The primarily function of the soleus is plantar flexion of the foot. Unlike the gastrocnemius, the soleus does not cross the knee and has no action at that joint. Because of this, when the knee is flexed, the gastrocnemius is at a mechanical disadvantage and the soleus must perform complete plantar flexion. The final muscle of the lower leg we will examine is the tibialis anterior. The tibialis anterior originates at the lateral tibia and interosseous membrane (between tibia and fibula) and inserts on the medial cuneiform and base of 1st metatarsal. The tibialis anterior is a strong invertor and dorsiflexor of the foot. If there is one muscle group that is often the most difficult for someone to develop it is the calves. One of the reasons I think the calves are hard to develop is due to improper training of them. By improper training I mean using a poor range of motion (ROM). Often times you will see someone load up the seated calf raise machine and perform calf raises bouncing each rep and using about a 2" ROM. 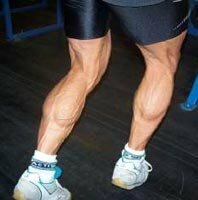 It is easy to become discouraged when it comes to bringing up your calves as they are often the hardest muscle group for people to bring up. It can be done though. Arnold used to try to hide his calves in pictures, sometimes even standing in water. But Arnold brought his calves up and they became one of his best muscle groups. You can do the same if you put forth the effort.